If new tech doesn’t start in Silicon Valley, it doesn’t take long for it to show up there. Now Bay Area Bitcoin enthusiasts will have a chance to turn their cryptocurrency into cold hard cash. On Thursday, Robocoin will unveil its new Bitcoin ATM in Mountain View at the 500 Startups’ Bitcoinferance. It’ll then move to a permanent home down the block at Coinage, LLC. The Las Vegas-based company was the first to install a Bitcoin ATM in the U.S. last month — and it’s expanding quickly. The company’s first ATM debuted in Vancouver in October 2013 and Robocoin has since added a second in Canada, four ATMs in Texas and just shipped 10 units overseas. The majority of this happened in the last month under the shadow of MtGox’s collapse and the confusion over Satoshi Nakamoto. Robocoin isn’t the only one trying to bring Bitcoin to the masses in the ATM interface that people understand. Both Genesis Coin and Lamassu are starting to sell and install models around the world, bringing competition to the market, changing public perception and making Bitcoin easy to use. The Robocoin ATMs allow anyone to sign up for a Bitcoin wallet and start exchanging money. To comply with anti-money laundering and consumer protection laws, the machine requires a phone number, a government ID and a palm print (taken with a biometric scanner in the machine) to create an account. The sign-up process takes around five minutes because a verification team has to triple check that the photo on the government identification matches who is standing in front of the machine, Kelley said. The images are also run against government watch lists to make sure they aren’t being used for money laundering or other crimes reminiscent of the exchange’s old ties with the now-defunct Silk Road. As soon as users are approved, they receive a link to their Bitcoin wallet and can start immediately converting dollars to Bitcoin. Withdrawals aren’t always instant though. Because of the Bitcoin protocol, it takes up to 10 minutes sometimes before the money is available. “It’s about as fast as the Bitcoin exchange is,” Kelley said. That doesn’t mean that the machines or Bitcoin itself are always easy to understand. As Jeff Roberts pointed out on his trip to the first Bitcoin ATM in Vancouver, the machine operators often hire someone to sit with the machine and explain how to use it. 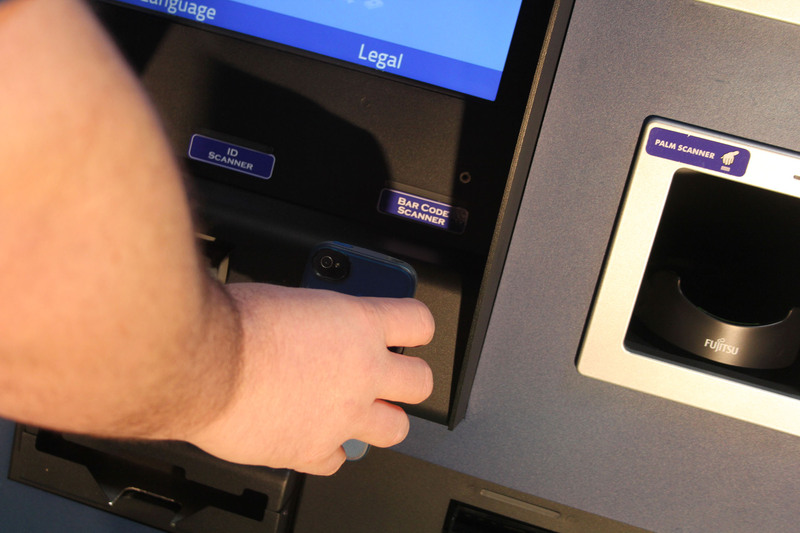 While most people would be surprised to see someone sitting outside a regular ATM all day, Kelley argues that they should be viewed more as bank tellers than babysitters. It’s an added cost for someone thinking of installing one, but Kelley said that most of its operators are still making around $10,000 a month in profit. As the ATMs continue to spread throughout the world, Kelley wants to capitalize on Bitcoin’s strengths when it comes to remittance. While Silicon Valley is an obvious point in the Robocoin expansion plan, Kelley has his sights set higher. He wants to see the machines in airports for easy currency exchanges, and, as they spread throughout the world, be used for remittance to send money to friends or family overseas with no added costs. wow, that completely goes against the point of privacy offered by using Bitcoin. Why would I give up all that information to a machine, first off, second as a matter of course for exchanging currency or buying a product? No, no way. legal regulations in usa. if you go to canada, they don’t require such verifications. it’s the same exact atm as well. Once in the BTC world you have numerous ways to regain your financial privacy. Many people would probably use ATMs like this just to get their feet wet or when time is of the essence. You can still send money orders to CampBX in the USA, up to $1000 per day. Also, you can buy locally from people using LocalBitcoins.com.